It’s time once again to step up and show your wololo spirit in our monthly contest. But first, the winners from last month. We asked you to come up with slogans to recruit soldiers for your armies, and boy did you all do a fantastic job! Picking the winners for this month was no easy task, and if we could just give all of you the prizes we totally would:P Keep up the amazing work, okay? Congratulations to the winners, and thanks to everyone who participated:) You all definitely brought your A game in May! We’ll pick our five favorites, and the winners will each be able to choose two of the below prizes! 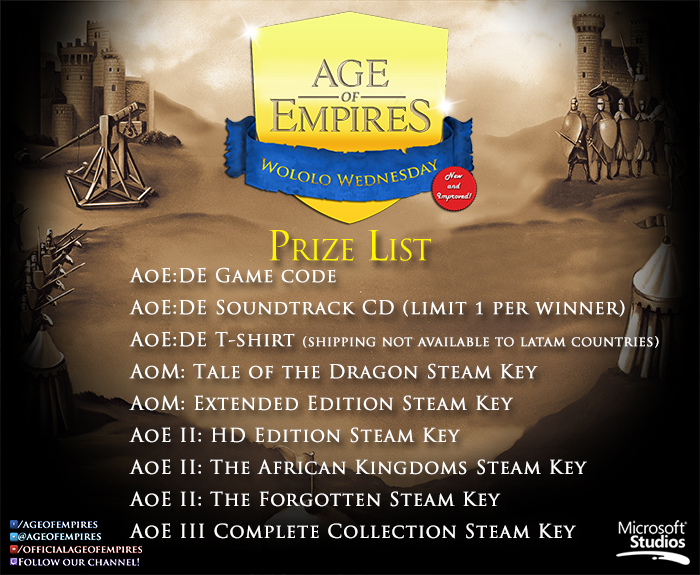 We’ll reach out to the winners via private message on forums.ageofempires.com on the first Wednesday of the next month, so keep an eye on your inbox! Submissions must be appropriate, and must be submitted in the forum discussion thread here before 5:00 PM PDT on Wednesday June 27th, 2018. You can find the full official rules here.